What should India to do to shift from”Service based” to “Innovation based Economy”? Entrepreneurs are made, not necessarily born.The growth in the Indian technology and services industry (IT and BPO) has created a strong “service-centric economy”.It is that India needs to shift from a service-based economy to an “innovation-based economy” and that’s very new to us. I believe India will claim the title of the global hub of IT and will be the de-facto destination for innovation and entrepreneurship in software and services. I also believe that in order for that to come true, India will have to “make” many more entrepreneurs. Every Indian is a born entrepreneur.entrepreneurs in technology make a living out of “short circuiting” a process—something that the world was used to doing a certain way, they figure out how to do it in less time, with less resources, or with better efficiency/accuracy.The combined revenue of the Indian biggies is less compared to the revenues of Google which itself answers the question. What India needs to focus on to create more Entrepreneurs? In order for us to make more entrepreneurs, we need to focus on creating an environment where innovation thrives and entrepreneurship can be developed. This innovation environment will be the backbone of what will make India claim it’s position as the global IT superpower. There’s an inherent entrepreneur in every one of the workers, which isn’t being brought out by the same old work, every single day. What companies need to do to promote Entrepreneurship? a. To make entrepreneurs, we have to educate people about how they fit into the innovation ecosystem, and what it takes to build companies. b. They’re expected to do their daily work, but discouraged to venture into anything creative, sometimes for security reasons, mostly for corporate paranoia. c. Companies block access to chat, message boards, and other forms of collaboration with peers, which is a requirement for the employee to tap into their creative energies. They’re not encouraged to think outside the box and come up with innovative solutions of any kind, and I mean encouragement in tangible form, not just words. I don’t expect Indian IT companies to require employees to spend 20% of their time on “innovation projects” like Google does, but do expect them to reward “collaborative innovation”—within and across corporate boundaries to innovate and be entrepreneurial. To make entrepreneurs, we have to encourage people to connect with others, showcase their work, and promote themselves. Do have a look at TechTribe news section for more of such motivating and entrepreneurial stuff!!! 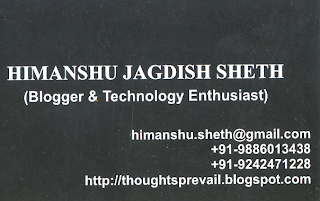 Himanshu : Finally a Blogger !!! 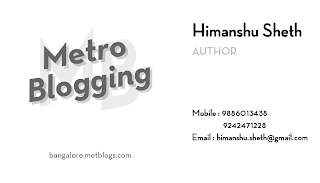 During my early days of Blogging,when I attended BlogCamp,Chennai I met Shiv who had his own identity through his own blogging card.This idea seemed to impress me and I also decided to have my own identity as a Blogger. Thanks Shiv for this excellent input!! Below is the scanned copy of my new visiting card!!! When YouTube acquired Google for $1.65 billion,it seemed Acquisition has become a buzz word.After this global acquisition, there has been a no of acquisitions in the Indian circuit as well namely Tata Steel takes over Corus,Mittal Steel takes over Arcelor.Well,these were not in the IT space but when I was just a post on Guy Kawasaki’s blog he had mentioned “When you create a company,it should make a meaning and should make a difference”. Guy Kawasaki also mentioned that “Many times Entrepreneurs feel that it is somewhat easy to get acquired by the big giants like Microsoft,Oracle,Google etc. ,if their company does not go public within a specified period of time” but this it is not true.Red Herring provides a good insight into the whole M&A scenario(taking the example of Microsoft and Google) and what should be the focus of upcoming companies. It’s tempting for entrepreneurs and venture capitalists to design a company today with a notion of who will want to buy it tomorrow. But that irritates deep-pocketed acquirers, who would prefer companies simply innovate, and let buyers worry about what’s worth spending money on. Google bought roughly thirty companies in the past three years. Microsoft buys between 15-20 companies per year.As per Bruce Jaffe, vice-president of corporate development at Microsoft:”Companies should do what they do best, and innovate”. I have been using JustDial services for the last 2-3 years and their response has been electrifying.Be it movies,companies,shops(or any damn thing),these guys would land you with the right information. Why are’nt there more semiconductor startups in India ? We have been coming across so many new companies getting funded by VCs and thats make us feel that “Entrepreneurship is on a rise in India” and VC’s are more confident on investing in upcoming startups in India. Now after good news, some bad news has to follow.Just came across this article , which mentions about the Semiconductor entrepreneurs Vivek Pawar of Sankalp Semiconductor,Uma Mahesh of Indrion,PVG Menon who is working on his own venture and many more in the list. Gani has a different viewpoint, “There is no dearth of money, what is lacking is a sound business plan.” In accordance, the skepticism on part of the VCs is understandable, also given the fact that this space involves more risk, and a higher capital. As opposed to a typical software services firm, where money is required for paying salaries, in the silicon space, technology development takes up a big chunk. Finally, somehow I managed to get “Make the Move-Demystifying Entrepreneurship” from Crossword today.The price of the book is just Rs 95/-,which is very(very) less compared to its content.It is written by two Entrepreneurs – Ishan Gupta and Rajat Khare. 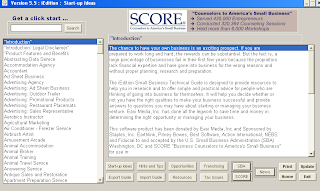 There are no of websites which would tell a person new in the field of business, how to make a business plan but EasiMedia is a website with a difference.